My name is Annie and I’m from Minnesota. I’m partial to interesting old houses and historic river towns. I make my living as a writer. Growing up, what were your feelings about the paranormal? I’ve been interested in ghosts and scary stories since childhood. Several factors contributed to this fascination with the spirit world. My Irish grandma used to tell me stories of banshees, faeries, the death coach, and the “death knock” heard when someone in the family died. There weren’t a lot of paranormal books when I was young, but I loved stories about ghosts and magic and Dorrie The Little Witch . When I was a teenager, I read books about Ed and Lorraine Warren and a book called Phone Calls from the Dead . I did see spirits on two occasions when I was a child. One spirit was a little girl in a white nightgown who ran past a slightly open door one night when I was staying at my grandparents’ house. The other spirit was a glowing man, who materialized from sunlight and dust motes at our house in South Dakota. What contributed most to my belief in and comfort with the spirit world was being raised Catholic. I grew up in a setting in which I was taught that there was an invisible world filled with angels, guardians, and saints. We learned that there were rules, courtesies, and protocols for communicating with the inhabitants of the spirit world and – very important to a child – my parents, grandparents, and teachers all believed in the spirit realm. When you were first looking at the house did you notice anything? Did the real estate agent or anyone in town say anything to you about the house? Did you do any research on its history? The energy of the house was heavy, with an expectant stillness. It felt as though we were being watched, especially in the back apartment where the previous owner, an old man, had lived. There were Catholic religious medals and bits of palm fronds over the doorways, so I knew the old man had been Catholic. We figured that the ghost was the old man, since his part of the house felt the most haunted. What we didn’t know was that the house was filled with ghosts. The house had been on the market for six months with no offers and, although it was shabby and rundown, you could see it had once been grand, with high ceilings and hardwood floors, four porches, and leaded glass windows. I didn’t do any research on its history, but I waited for a few days before making an offer to make sure its sleepy magic hadn’t cast a spell on me. I had a vivid flying dream about the house that I took to be a good sign. I made an offer and my teenage kids and I moved in three weeks later. When did you first realize it was haunted? Well, my realtor and I both noticed that the sentient heaviness and feeling of being watched as soon as we stepped inside. This feeling intensified when we went down to the basement, and especially the dirt room where (we would later learn) the old man had hidden something important. Your house has multiple ghosts. Who are they? What do they do? Do you know why they’re there? The main spirit is the old man who lived here before us, Leon Kuchenmeister. I believe he was earthbound when we first moved in because he had some important unfinished business. Now I consider him an ally and a partner in taking care of the house. I saw Leon once, shortly after we moved in. He looked like a solid person in a physical body; he was heavy set and slightly stooped and walked as though he had aches and pains. Leon makes his presence known through pounding on walls, slamming doors, clearing his throat, and turning the kitchen light off and on. He has also helped me by physically tapping on my shoulder and waking me up when I fell asleep with a candle lit. I’ve learned through psychics, dowsers, and Leon himself that this house is filled with portals and that’s why so many spirits come through. Leon, who worked as a carpenter in his lifetime, calls the portals doorways. He told one of the psychics that this house is “filled with doorways; it’s like grand Central Station for ghosts.” He said he didn’t much like it when he lived here, but now that he is on the spirit side, he sees the need for an entry point. There are two old-fashioned spirit sisters who lived here in the late 1800s and early 1900s. They first appeared the night we brought an antique seed poster door up from the dirt room. I have seen two sisters on one occasion and one sister on two subsequent occasions. They appeared as teenage girls with pompadour hairdos and long white dresses. They were transparent and floating in the air. The sisters turn the seed poster door spotlight off and on, and have made the chandelier sway. Occasionally, they’ll respond to questions with gentle tapping knocks. Over the years that I’ve lived here, I have also seen a dark, oily man that I call Dark Man; a woman made of light; black blobs that seem to be aware, the non-sentient image of an incredibly sad woman sitting at the foot of my bed, and small hooded beings, among others. 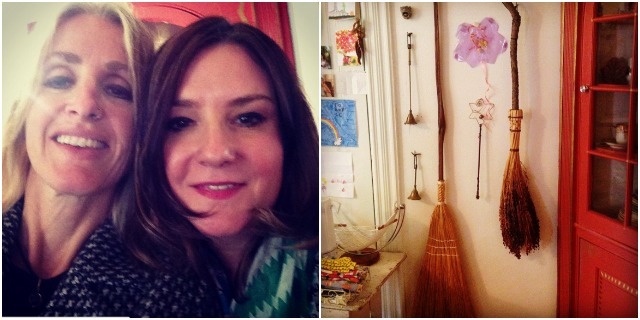 Have you ever tried to have your house ‘cleared’ or exorcised? Once. It was a mistake. In a nutshell, it was a misunderstanding on my part during a film shoot at my house. Afterward, I felt that I had betrayed a friend and learned some important lessons. One, that not every visiting spirit is trapped and needs to be helped. Two having allies in the spirit world is a very good thing when you live in a haunted house. Do you yourself ever try to communicate with the ghosts? Yes, I have spoken with the spirits, hosted paranormal investigation teams, held séances, had numerous psychics visit my home and speak with the spirits, and had spirit mediums come in and channel messages. Do the people in your life know that your house is haunted? I’m pretty sure everyone in my life knows about my house – even strangers approach me to ask if I’m the woman that lives in the haunted house! Nearly everyone I know seems to get a kick out of discussing the spirits, asking for the latest ghostly news, or sharing their own ghost stories. The very notion of a friendly haunted house seems to generate a lot of positive energy, trust, and connection, all things the world needs more of. Are your friends and family more or less likely to want to stay at your house knowing that it’s haunted? More likely. Nearly all of my guests, whether or not they believe in ghosts, want to hear the latest ghost stories and encounters. I offer haunted tea parties and other spirit-themed events at my house. I believe it’s accurate to say that in the nearly 20 years I’ve lived here, hundreds of people have experienced spirit communication of some sort. My house has a very powerful astral component. One of the most common experiences that overnight guests have when they spend the night is waking up and not being able to tell if they’re awake or asleep. They feel completely awake and aware – but then see an unfamiliar person or animal or a ball of light near their bed or in the hallway. One guest was sure he was awake – until he started flying through the house! These kinds of experiences happened to me quite often in the first years that I lived here. Are there any benefits to having a haunted house? Oh, there are lots of benefits to living in a haunted house! Of course, the spirits here are companionable rather than unhappy or destructive, and that makes all the difference. For one thing, living with spirits make life more interesting; I never know what is going to happen. Strange things occur. I’ll see kaleidoscopic patterns of light and color, or an unfamiliar spirit, and I try to figure out what is happening or who is visiting. I tell people that living in my house is like living in a never ending story or puzzle. It’s like being in a Scooby Doo episode that never ends! I’m learning a lot about the astral world and am able to share what I’ve learned with others. I’m familiar and very comfortable with my house and I have allies and helpers in the spirit world helping me protect it. So for friends and guests who want to have a direct encounter with the spirit world, I believe I can offer an opportunity to do so in an environment that’s safe and positive. Have you ever considered moving? If you do move, will you tell the new owners about the ghosts? I don’t plan to ever move! I love my house and feel very connected to it energetically. It’s part of my identity. But I do believe that prospective owners should be informed if the house they’re buying is haunted. In fact, at some point when I’m older, I’ll probably start looking for my home’s next caretaker—someone who will love the house as much as I do and be a good steward of the house and its astral inhabitants. Thanks so much for sharing your story, Annie! Do you guys have any questions for her? Have any of you encountered ghosts? Wow. Before I comment further, full disclosure: Part of the work I’m called to do in this lifetime involves clearing/healing the energy of spaces and people. I’m an energy renovator. 🙂 In fact, I’m renovating a house in Alaska today (from my office in New Hampshire). When I reached the point in the post about portals, that stopped me short. My experience with portals, during clearings, has been less than lighthearted. Then again, the portals I’m shown during clearings are those that are allowing less-than-lighthearted entities access to the physical realm. 1) Does the house need clearing? Answer: No. 2) Are there multiple portals in the house? Answer: Yes. 3) Are there any among them that aren’t “safe”? (Safe meaning: Only allowing spirit allies through.) Answer: Yes. 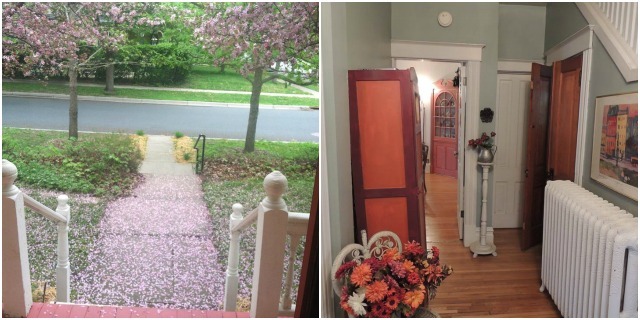 There is one portal in your home that resembles an earthly wormhole, supersized. Perhaps best to have one of your contacts, someone who does similar work to me, seal it. Thanks for the great read this morning! 🙂 Peace. Thanks for your post! I appreciate your tuning in to my house and sharing your thoughts and expertise. I have been told by many psychics that there is a reason for all the portals to be open, but I would like to explore your impressions further if you’re open to that. (I’m working on a new book about my house and would like to possibly include your perspective in the section on the portals. If you’d like more information, could you email me at the address on my website? (I’m not sure what the etiquette is regarding including my email address in a post.) Thank you. I’m happy to hear that the past residents/visitors in your house have been good to you. 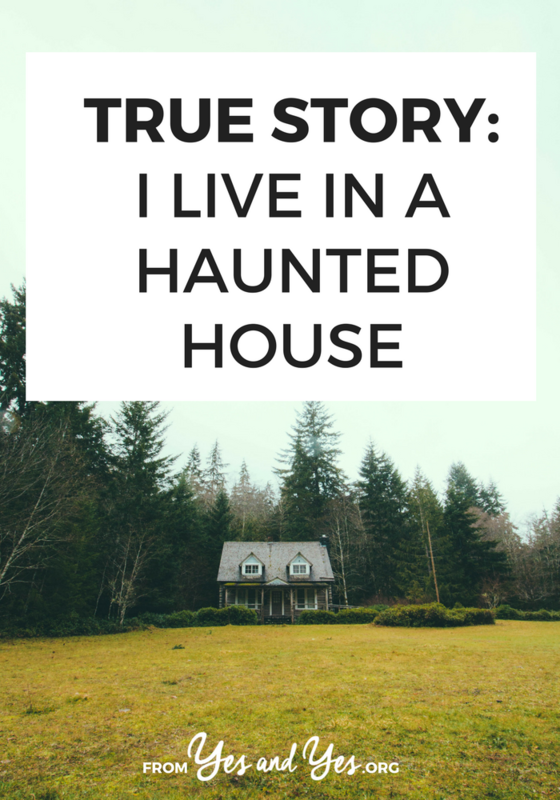 I know firsthand at what it’s like to have a bad spirit live in your house and cause trouble. Things like throwing books across the room, stomping down the hallway, and touching your shoulder or arm. It never felt playful or kind. Being alone when things would happen was the worst, because we lived 30 minutes from town and cell reception was only available in certain areas of the house. Although it happened to both my sister and I, our parents refused to move out until our year’s lease was up. So it was surprising to hear about your ghosts becoming your allies. I’m hopeful for your situation and hope that they stay good and protect you. My question to you is, how do you keep from being afraid of spirits/ghosts? That’s so scary, Ashley! I’m so sorry you went through that! Thanks for your post; I have lived in my house for 21 years so I feel very secure here. I’m sorry that you had some not cool experiences with spirits. I do talk about safe practices and clearings in my book “Spirits Out of Time” but if you ever encounter a situation like that again, I highly recommend Michelle Belanger’s book. “The Ghost Hunter’s Survival Guide” ~ it’s one of the best books on psychic protection and safe practices I have read. To answer your question (and related to the practices described by both Michelle and me for protection) having a strong sense of self/boundaries is one of the best ways to be respected and safe ~ I get angry when astral beings are disrespectful to me, my guests, or my property. Anger is not good energy to be mired in, but it can be a great catalyst for positive action. I use it as a source of energy (and courage) to take action and reestablish boundaries, equilibrium, and harmony in my home. Funny! A life coach and death coach probably couldn’t be much more different…. this was so interesting! i think i’d be all kinds of “NOPE!” about living in a house with spirits, but i’m glad annie is so positive about it. Thanks for reading the interview and posting! One of my favorite True Stories to date (I’ve been reading for years). I’m so happy that you have such a positive experience. I’m wondering how your children feel about the other inhabitants of your home. Have they had similar encounters? Thanks, Ashlie! I’m happy you enjoyed reading about my experiences living with spirits and appreciate your post. My kids were teenagers when we moved in and, since the spirit activity didn’t seem dangerous or dark, they thought it was kind of novel. They’ve both had ghost experiences here, which I wrote about in my books “House of Spirits and Whispers” and “Spirits Out of Time.” There are excerpts of all my books on my website. Stop by! Wow Annie. The unknown has always freaked me out and the thought of living in a haunted house. Your story was really inspiring to read. I get so tired of so-called paranormal experts who claim that spirits are only residual energy, an imprint in time, and they can’t be interacted with. Or there’s psycokinetic energy emitting from the living causing doors to shut, lights to go on and off, etc. While that theory may apply to some paranormal circumstances, it certainly does not apply to the documented eyewitness accounts where perfectly sane, rational, intelligent people have experienced interacting with spirits. I don’t care what the arrogant, bias, pseudo-skeptics say either. They’re job is to debunk everything and anything paranormal by name calling and repetitious personal opinions. The fact is: there are dwellings that harbor intelligent energies of former living human and sometimes former living animal life. It’s been documented professionally for over 100 years. And while the paranormal isn’t deemed a scientific fact, there is a plethora of scientists and researchers who readily accept the survival of consciousness theory and growing. I realize it’s hard or even impossible for some people to grasp the idea of surviving death, but for those who’ve experienced the unexplainable, up close and personal, we know what we’ve seen, heard and felt!